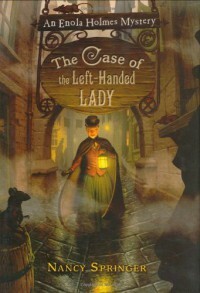 This is the second book in Nancy Springer's series about Sherlock Holmes' younger sister Enola. She's in London and trying to stay below the radar of her brothers while still doing good, and the stresses of maintaining several identities is beginning to grind Enola down. She stumbles upon an apparent elopement of an upper caste daughter and only just manages to keep out of her brother Sherlock's hands while solving the mystery. As with the first book in the series ([b:The Case of the Missing Marquess|606928|The Case of the Missing Marquess (Enola Holmes Mysteries, #1)|Nancy Springer|http://d.gr-assets.com/books/1309288606s/606928.jpg|3313623]), this one is a fast paced, enjoyable read. The Mesmerism plot is hackneyed but - upon reflection - is reminiscent of Conan Doyle's style of writing in some of his Sherlock stories. Highly recommended both to adults and/or that adult looking to find something exciting for his/her "rugrat" to read.